Archaebacteria are organisms from the domain Archaea, which have characteristics of both bacteria and eukaryotes. They are single-celled, and typically can reproduce via asexual reproduction. Some archaebacteria are able to transfer genes to other individuals through distinct structures. All archaebacteria fall within the domain Archaea, which is genetically distinct from both the Bacteria and Eukaryota. A number of simple rod-shaped archaebacteria can be seen in the image below, though the entire domain contains great diversity. Archaebacteria are typically unicellular, though some species may form complex networks. These cells are typically spherically, called cocci, or rod-shaped, called a bacillus. They also come in a number of other shapes, including spirals, square, triangular, and strange forms with many flagella. Like bacteria, archaebacteria are surrounded by a cell envelope. This complex structure typically includes three parts. The layer closest to the cytoplasm of the cell is the plasma membrane. Though superficially similar to bacterial and eukaryotic cell membranes, the archaebacteria use a unique phospholipid to build their plasma membranes. Instead of straight fatty acid chains, these phospholipids have branched tails. This creates a unique membrane structure. The second part of the cell envelope is the cell wall. Though archaebacteria have a variety of structures which make a cell wall, they do not use the peptidoglycan molecules found in bacterial cells. The final layer of a typical cell envelope, the capsule or slime layer, is only rarely found in archaebacteria. As in bacterial cells, the DNA within an archaebacteria is localized, but not surrounded by a membrane like in the Eukaryota. This nucleoid stores the genetic information of the organisms, and is transcribed by similar but genetically distinct proteins. For instance, their RNA polymerase proteins function in a similar way, but have a different amino acid arrangement. It is by analyzing the DNA and RNA of archaebacteria that it was determined they were distinct from both the eukaryote and bacterial domains. As with some bacteria, many archaebacteria have a number of structures intended for motility. Among these are flagella, gas vesicles, and pili. The flagella of archaebacteria are distinct from those of eukaryotes or bacteria, and are composed of several different protein subunits. Archaebacteria commonly have small protein hair-like projections called pili, which can twitch and aid in movement. Further, many have an internal vesicle which can fill with gas. This helps carry the archaebacteria into the proper place within the water column. While archaebacteria are like bacteria in that they have no distinct organelles, they do have other identifiable internal components. Many archaebacteria have inclusions, which are collections of stored cellular materials and nutrients. These small bundles can allow the cells to store carbon, phosphate groups, and other important substances. Within an archaebacteria cell you can also find ribosomes, complexes which build proteins from the genetic code. 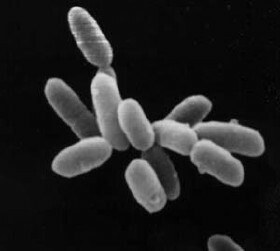 There are three phyla of archaebacteria, as seen in the image below. These are the Crenarchaeota, the Euryarchaeota, and the Nanoarchaeota. Though these groups are distinctly different, they are much more closely related that to other groups. 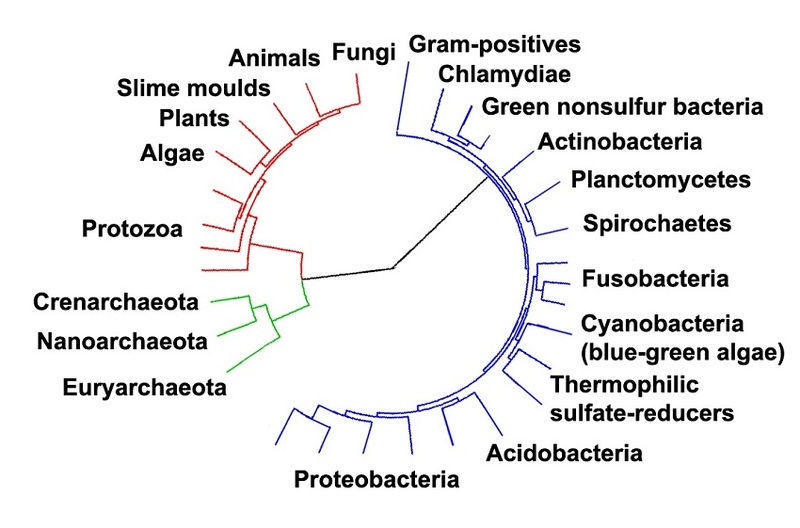 The archaebacteria are seen in green. 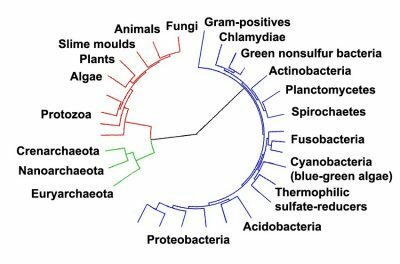 The bacteria are blue, while the eukaryotes are red. The differences between these groups is largely based on ribosomal RNA evidence, which can detail the genetic difference between the sequences which create ribosome proteins. In general, the Euryarchaeota include organisms that create methane, survive extreme salt concentrations, and include some thermophilic organisms. The Crenarchaeota include organisms that are found in marine and soil environments, but also organisms found in hot sulfur springs. The exact number of types and species of archaebacteria is currently unknown. These organisms represent a diverse group of organisms, which have expanded into an unknown number of environments. Often, the only way to find them is to take multiple samples and analyze the samples for the presence of DNA and proteins. This is a very laborious process, but has identified many new forms of archaebacteria. Archaebacteria live in a number of environments. Halophiles live in salty environments, capable of tolerating much higher salt content than present in the ocean. Hyperthermophiles thrive in high temperatures, such as 85 degrees Celsius. That’s close to boiling! Others are thermoacidophiles, preferring both high temperatures and an acidic environment. Other archaebacteria, such as methanogens, live deep within the ocean floor or earth, and produce energy using a variety of inorganic reactions. Typically, these environments are super harsh for other organisms. But, the archaebacteria have evolved a number of mechanisms to deal with these harsh environments. This could mean proteins that operate at higher temperatures, DNA which is protected from acidic environments, or other adaptations. Buried under the sea floor, created by the action of billions of microorganisms, is an enormous mass of methane. This is unfortunate for humans, considering that methane is a more potent greenhouse gas than carbon dioxide. If this mass were to escape from the seabed, it would accumulate in the atmosphere and massively accelerate global warming. Lucky for us, a group of archaebacteria known as Methanosarcinales eat methane. Surviving in pockets surrounded by a companion bacteria, these archaebacteria take in methane and convert it to other products. In doing so, they extract energy from the molecules and are able to survive. This makes these archaebacteria methanotrophic, which is only seen within Archaea. Some archaebacteria have developed unique sensory structures, which can inform the cell about their position in the water column. Certain archaebacteria in aquatic environments are very sensitive to UV light. At certain depths, there is no food or oxygen, but at the surface the UV light will quickly destroy the DNA. To know where the archaebacteria is within the water column, it has a series of proteins called sensory rhodopsins, which become activated when stimulated by certain colors of light. As the blue light increases and red light decreases, this signals to the cell that it is sinking. It can then fill the gas vesicle or move its flagella to move up the water column. When it gets too close to the surface, the level of red light will increase and the archaebacteria will reverse these actions to sink back down. 1. Which of the following statements about archaebacteria is not true? 2. If you had to go into your backyard to find an archaebacteria, where should you look? 3. Some archaebacteria exist connected to other individuals via fibrous networks. What benefit can this provide to the organisms? Cain, M. L., Bowman, W. D., & Hacker, S. D. (2008). Ecology. Sunderland, MA: Sinauer Associates, Inc.
Willey, J. M., Sherwood, L. M., & Woolverton, C. J. (2011). Prescott’s Microbiology (8th ed.). New York: McGraw Hill.